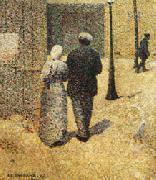 Man and Woman on the Street (1887) by Charles Angrand, which can be found at the Mus? ?e National d'Art Moderne. 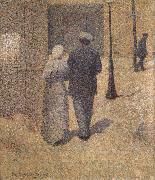 French Pointillist Painter, 1854-1926.French painter. He was trained at the Acad?mie de Peinture et de Dessin in Rouen, where he won prizes. 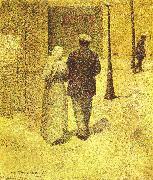 Although he failed to gain entry to the Ecole des Beaux-Arts in Paris, Angrand began to win a controversial local reputation for canvases in a loosely Impressionist manner. In 1882 he secured a post as a schoolteacher at the Coll?ge Chaptal in Paris. With this security he was able to make contacts in progressive artistic circles, and in 1884 he became a founder-member of the Salon des Ind?pendants. His paintings of this period depict rural interiors and kitchen gardens, combining the broken brushwork of Monet and Camille Pissarro with the tonal structure of Bastien-Lepage (e.g. In the Garden, 1884; priv. col., see 1979 exh. cat., p. 27).